Most everybody has a favorite book or book series. I want you to make a card of a character from one of your favorite books. Please tell which book your card is based off. Cards will be judged on balance, flavor, and grammar/spelling. Citing the artist will help break ties but is not needed. 1st place gets 5 favorites and a follow. 2nd place gets 4 favorites and a follow. 3rd place gets 3 favorites and a follow. Honorable mentions get 1 favorite. My personal favorite card gets favorited. Cards will be judged on September 10th. 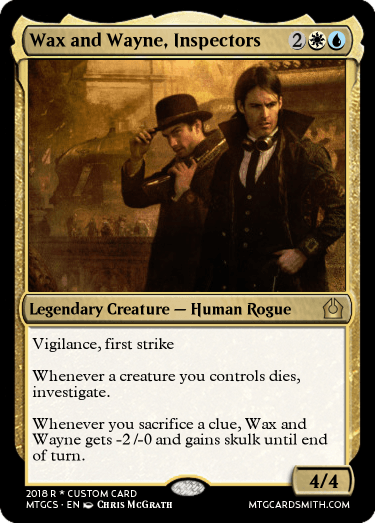 Hailing from Alloy of Law, the fourth book in the Mistborn series by Brandson Sanderson, this card features the detective duo of Waxillium Ladrian and his partner Wayne! Waxillium is a skilled detective called upon for aid in the most mysterious of cases, while Wayne is a man who can disguise himself as almost anyone without fail, sneaking under radars. Although, they end up split up fairly often, so you've got to choose which you want to attack with. 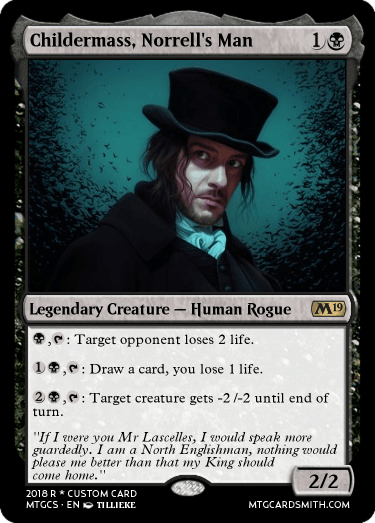 Flavor text is a quotation. 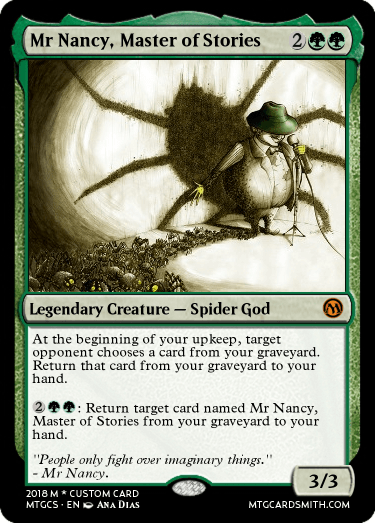 Mr Nancy, the trickster spider god Anansi from American Gods and Anansi Boys, both by Neil Gaiman, two of my all time favourite books. Expect more entries from me soon, as this is an awesome contest. Entry number two for me. 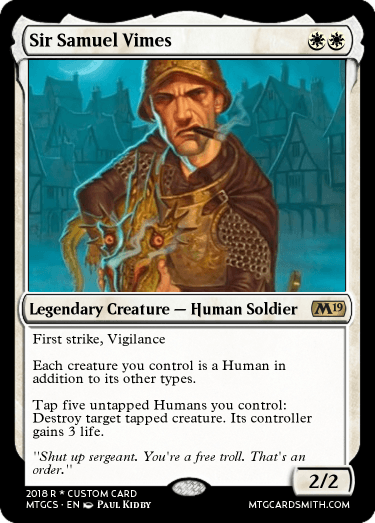 This is Sir Samuel Vimes from the fantastic Discworld series by Terry Pratchett. My third and final entry. If I had to pick one book to be my favourite novel of all time, it would be the wonderful Jonathan Strange and Mr Norrell by Susanna Clarke. From this the best character has to be Childermass. Count Olaf from "A Series of Unfortunate Events". +1: He disguises himself to avoid being caught. -8: He burnt down the house of the Baudelaires (among other houses) to get his hands on the three orphans (among other orphans) and their fortune (among other fortunes). @ningyounk, I think that it’s great! Wait.. was the planeswalker template updated? I realized that... when do you think that they're going to update the template? Thanks for bumping this! I will submit something soon if I can find art. OK then! Although the rules say that this contest will be judged today, due to lack of entries, I will be extending the deadline 1 more week. Is it ok if I just make a placeholder for art until i come across something that I like? Here are two main characters from a book named Ico: Castle in the Mist, written by Miyuki Miyabe, and inspired by the PlayStation 2 video game "Ico." The story tells about a thirteen year old boy Ico, who is born with tiny horns in a small village. Once in a generation, a cursed child is born and on his thirteenth birthday's night, his horns finally grow long and curved. It is a mark of death, for each child with long horns is brought to the isolated and empty Castle in the Mist to be sacrificed. But when Ico is left to one of the castle's sarcophagi trapped and alone, a certain chain of events liberates him. At the beginning of his journey to leave the castle, he finds Yorda, a mute girl who has been trapped in a cage for countless generations. 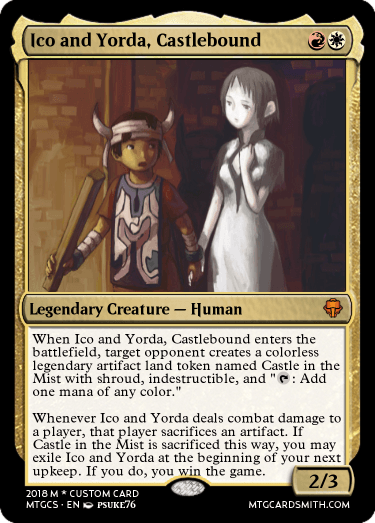 Ico sets Yorda free, and they form a special bond as they face the many obstacles and dive into the mysteries of the lifeless Castle in the Mist together. They desperately try to puzzle the right way to outside world and freedom. @fms, I take it you took my advise! Where have I heard of Brandon Sanderson before? What else has he written?